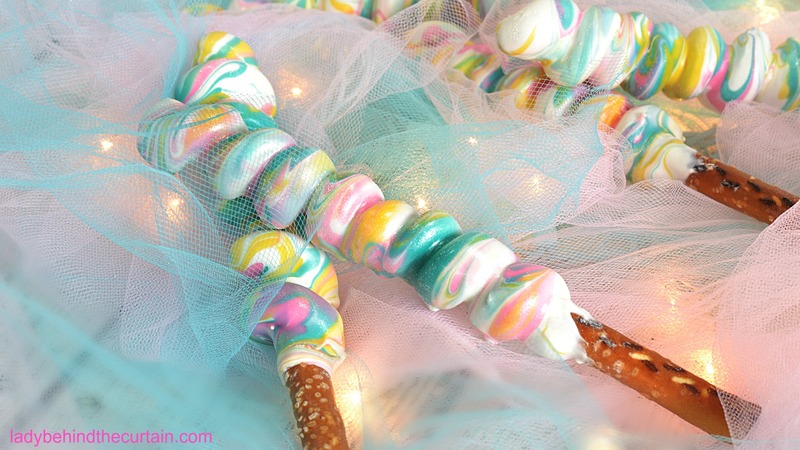 Unicorn Pretzels| These super cute pretzels will bring out the inner unicorn in everyone at the party! The sweet and salty flavors of these fun pretzels will make your guests taste buds tingle with delight! 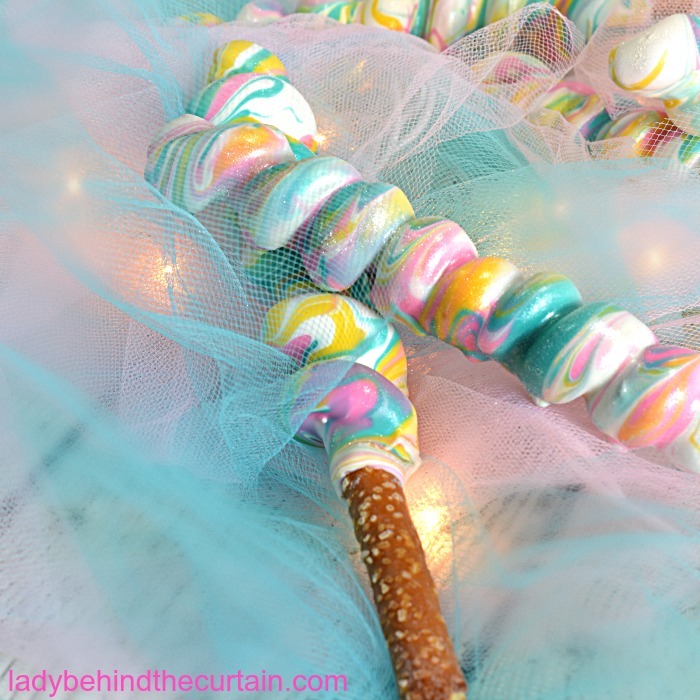 Full of yummy magic you can bet these fun Unicorn Pretzels will be the talk of your celebration! Perfect for a little girls birthday party! Pass them out as party favors wrapped in a pretzel bag or place them in mason jars down the center of the party table to make the most magical centerpiece. By now you might be wondering how I got the spiral effect on the pretzel. 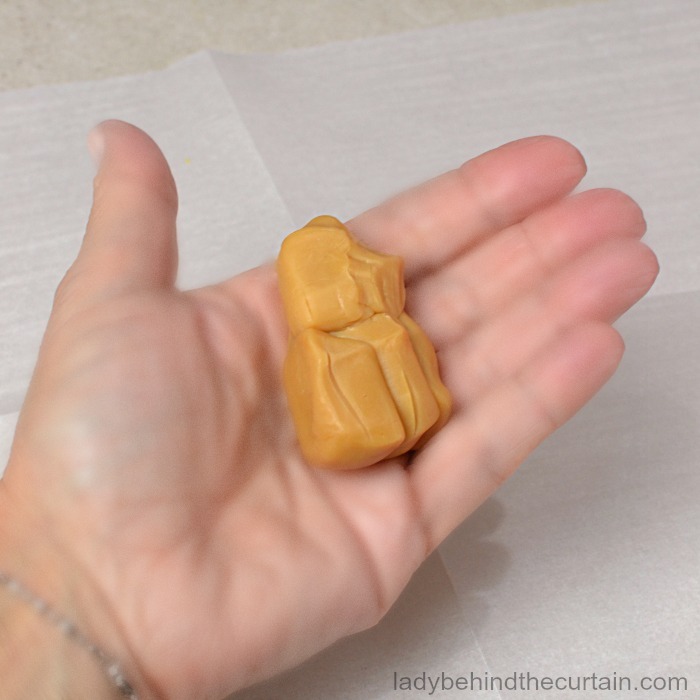 My secret ingredient is….CARAMEL! Not the kind you have to make but good old store bought! 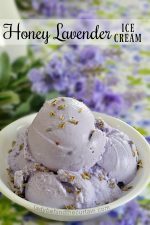 Read below to see how I take store bought caramel and several different colors of candy melts to create not only the tastiest but incredibly beautiful pretzel treats! Feel like you might get stuck? Don’t worry I also created an easy to follow step by step video. You can view it below! 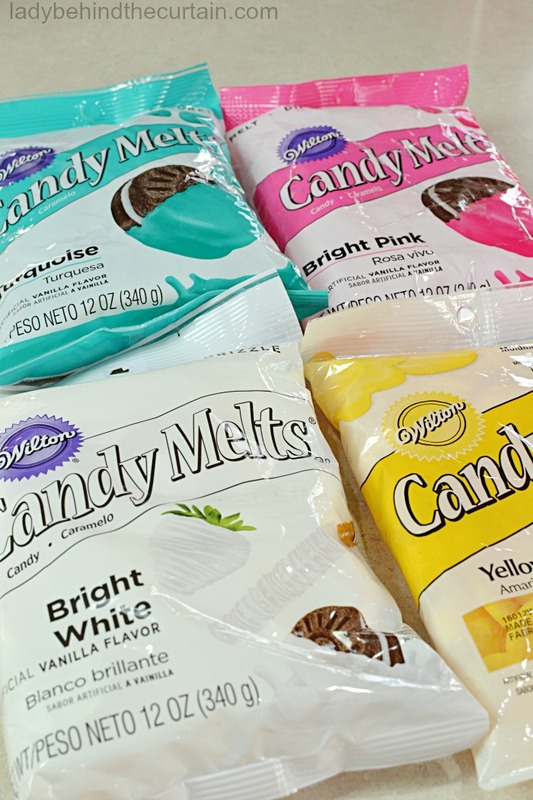 I discovered something amazing for candy melts and that is a candy melting pot from Wilton! It makes melting candy so easy! Get all your candy melted and ready. 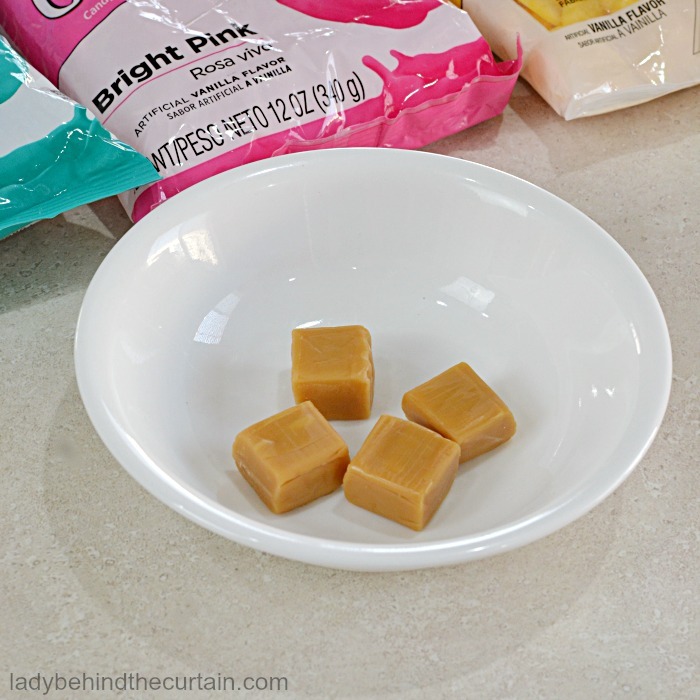 Pour candy in medium microwave safe bowls. 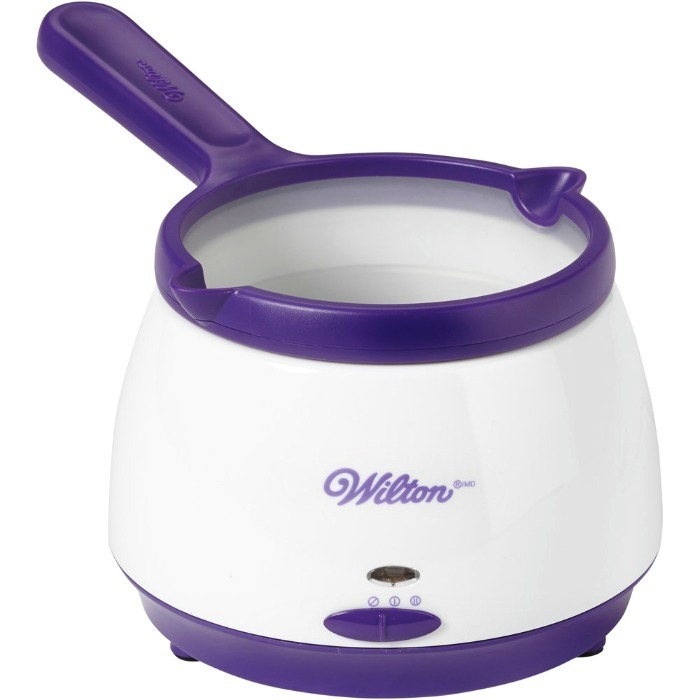 Heat one at a time at 60% one minute, stir and continue in 30 second increments until candy is melted and creamy. In a small microwave safe bowl heat FOUR caramels on high for 10 seconds. I only worked with four at a time. This is just the right amount of time to allow the caramel to be molded into a 12-inch snake shape. Roll heated caramel on a piece of parchment paper to 12-inches. 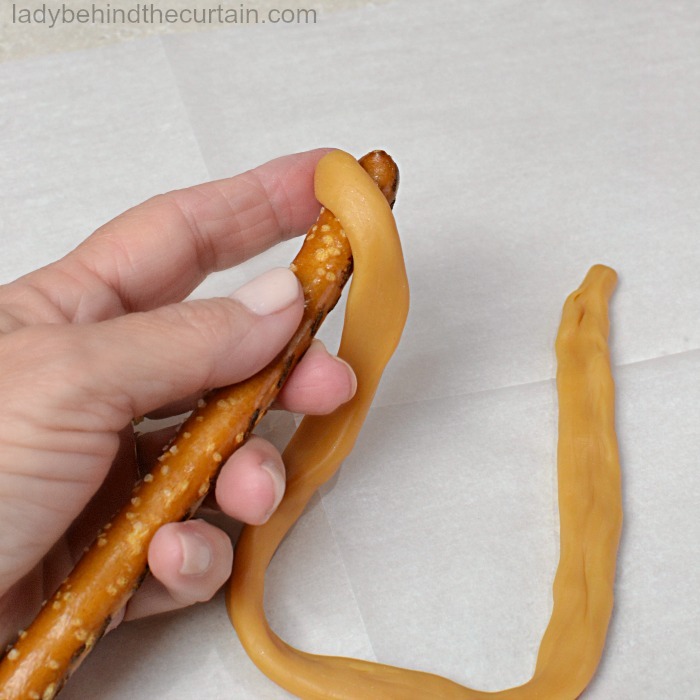 Starting at the top of the pretzel rod, wrap the caramel around. 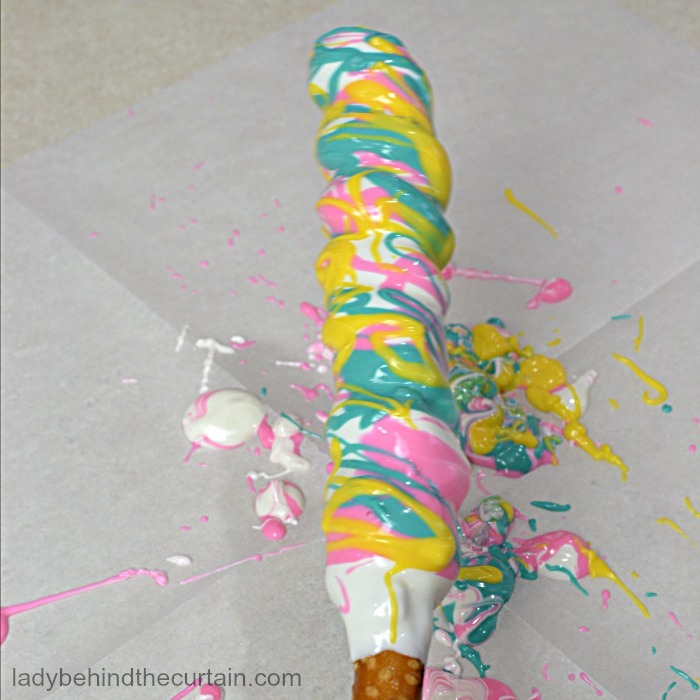 Dip pretzel in the white melted candy. Only tap off a little of the candy. 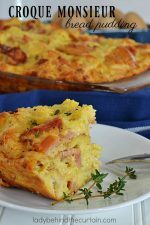 You want this layer to be thick. Add a drizzle of pink then turquoise and yellow. Tap and turn the pretzel always going the same direction. The colors will start to create a marbling effect. If you see a spot that needs more color then go ahead and add it and continue tapping and turning. Place in a container (mine was filled with rice) in the freezer for 10 minutes or until hardened. 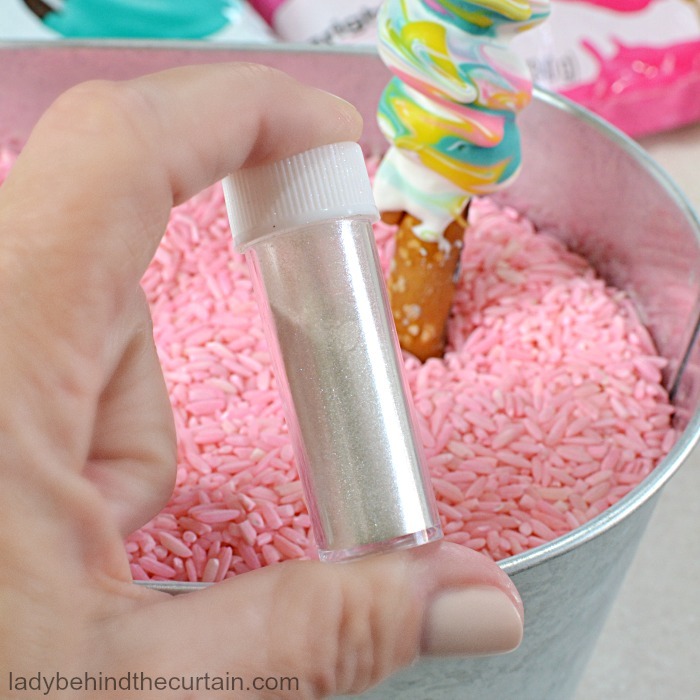 Pour some of the pearl dust into a small container and brush some onto the pretzel. Pour candy melts into medium size microwave safe bowls. Heat each color 1 minute at 60%, stir and continue heating in 30 second increments until creamy. Do this procedure for each color. Take wrapping off 4 caramels and place in a small microwave safe bowl. Heat on high 10 seconds. Roll caramel into a 12-inch long snack. 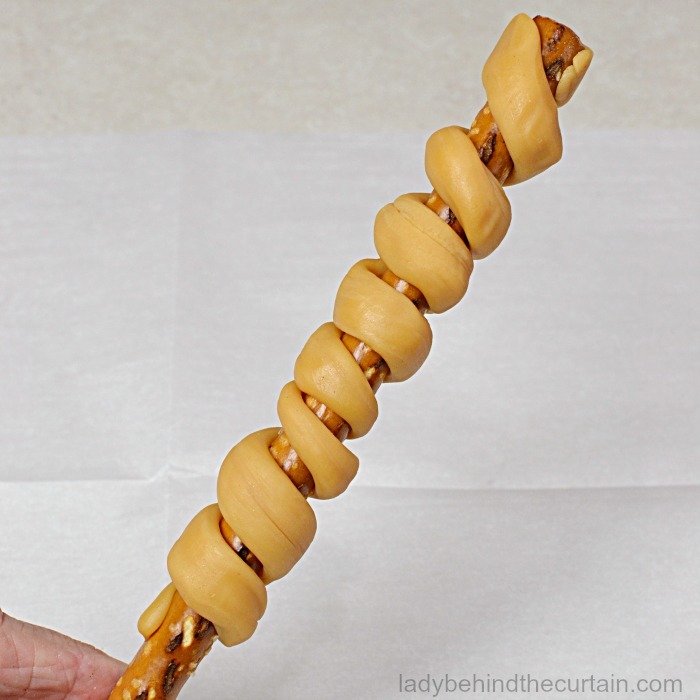 Starting at the top of a pretzel rod; wind the caramel around. Dip or spoon the white candy over the pretzel making sure to fill in between the caramel and pretzel; tap off some of the excess but not much. You want to leave a thick coating. Drizzle the pink, turquoise and yellow over the white. 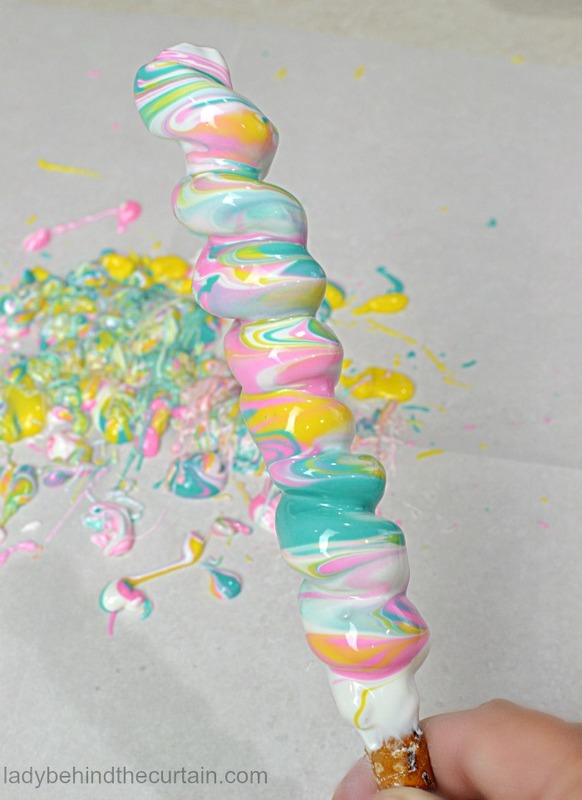 Turning the pretzel and lightly tapping at the same tip will create a marble effect. If you see a spot that you would like more color in, go ahead and add more and keep turning and tapping. Place upright (I filled a jar with rice) in the freezer for 10 minutes. Pour some of the pearl dust into a small container and brush onto the hardened pretzel. Absolutely adorable! 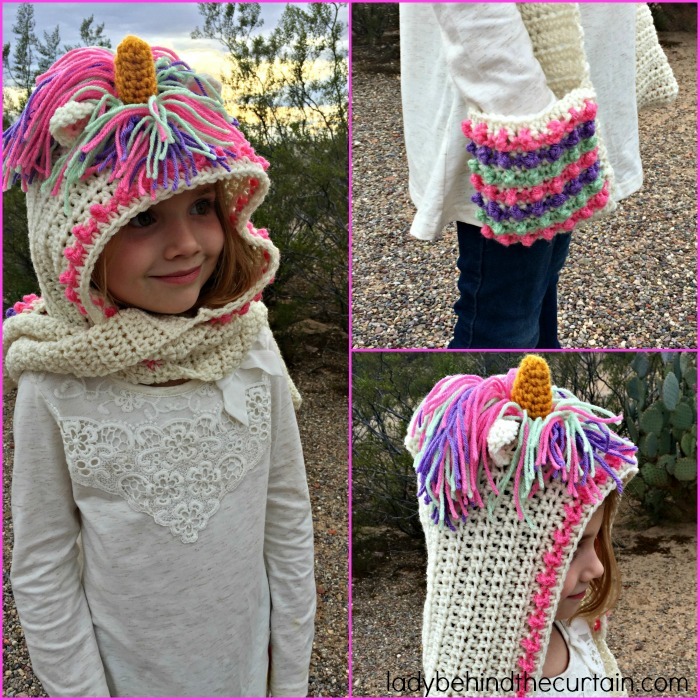 I can see these being a huge hit with every little girl! Thanks! 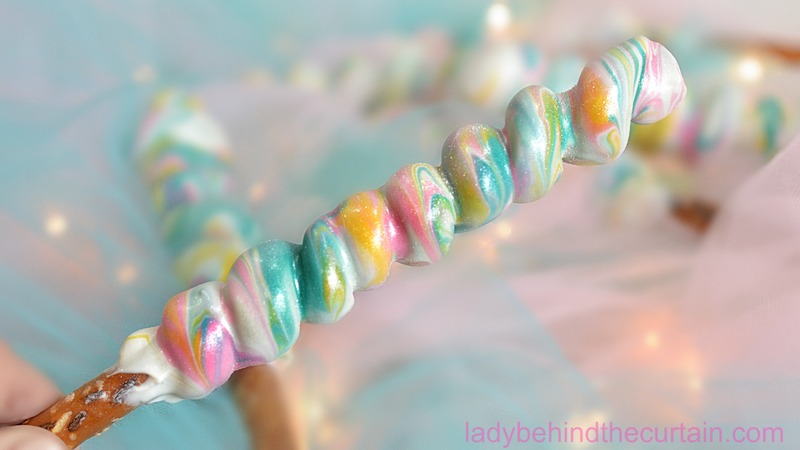 I had a lot of fun creating these Unicorn Pretzels! I just love these!!! But how did you get your rice pink? What a great way to display them!! Hi Judy, It’s super easy. I keep bags of different colors for decorating at parties. Here’s a post I did on How to Color Rice. 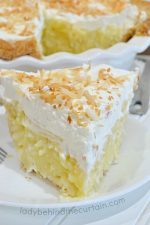 How far in advance of a party do you think these can be made? Hi Kristi, I think at least a week. How do I store them once I make them? 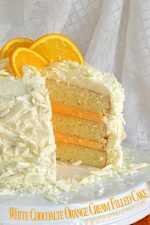 My party is in 2 days but I’d like to make them today. Hi Amanda, You can store them in an air tight container on the counter. Have fun! May be a dumb question but does the caramel hurt your teeth when eating it and can I make it the day before ? Hahaha Carmen. I totally know what you mean. 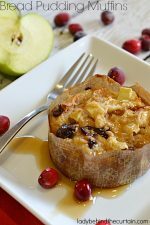 I was afraid of that too and was very pleased when I took my first bite and the caramel melted in my mouth without sticking to my teeth. 🙂 You can decorate these pretzels days in advance. Yes, Carol. They will keep for at least a week if not longer. Question do you let the white chocolate dry before you marbleiz it or do you do it while the white chocolate is still wet. Hi Raven, Thanks! Yes…add the other colors while the white is still wet. My question is,do you think the caramel could be molded onto the pretzel enough to be the horn for a unicorn cake?! If so,do you have suggestions on how to accomplish this task. 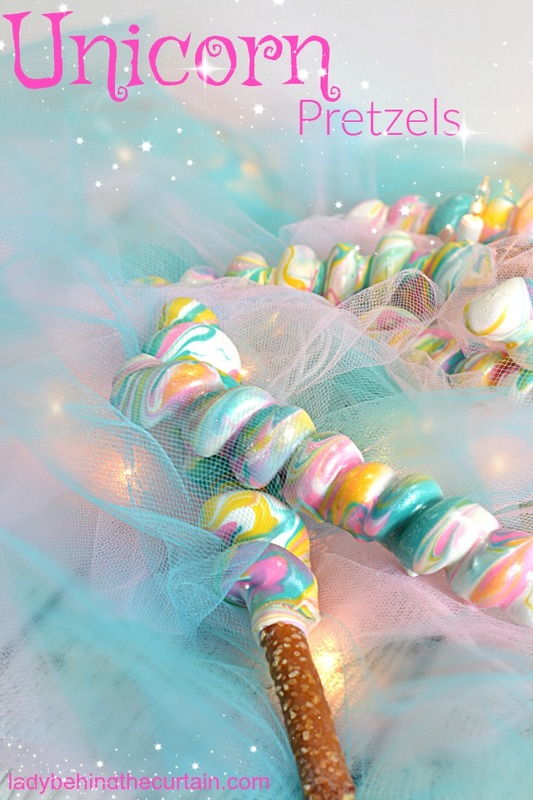 Yes Sheila, I would use the same technique I used for these unicorn pretzels. The great thing about this caramel is that it’s thick and pliable. Once the melted candy hardens the caramel stays in place. 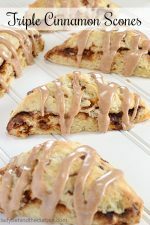 Is thier anything else that can be used besides caramel, to get same shape? Hi Rebecca, any soft candy can be used like starbursts. Not sure about the flavor though. What kind of caramel did you use?? Hi Mary, I used Kraft caramels that are square and wrapped. This is a great idea! How many pretzels do they make? My daughter is having a bake sale for a fundraiser. Just wondering if it’s cost effective. Thanks!